Well would you look at that…Menu Plan Monday really on a Monday….I think that’s a first! 🙂 The reason for the later posting? Easter dinner at our house! Thankfully everything went according to plan and turned out beautifully. I posted about my Easter dinner menu last week but as the week went on I knew I wanted to simplify it even more. When I have guests over I don’t like to spend the time that they are visiting in the kitchen. I want to be out visiting and enjoying the company so I prefer to plan dinners where most of the work can be done in advance. The ham recipe I decided to do in the crockpot instead. The night before I simply put the ham in the crockpot, poured the pineapple sauce over top and put the whole thing in the fridge ready for me to just pull out and turn on the next day. Doesn’t get much easier than that and it was delicious! To save time I roasted my potatoes for the Special Twice-Baked Potatoes the night before as well. The next day I just had to scoop the pulp out and add all the yummy good stuff. I then left them on the counter covered in foil until it was time to throw them into the often just before dinner. 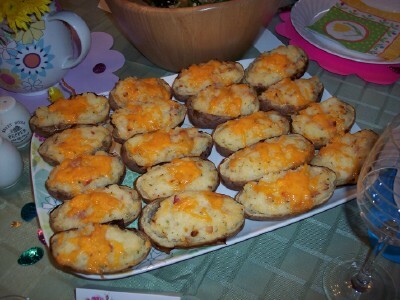 Love twice baked potatoes especially with bacon! What else, oh yes, Focaccia Bread made with dough from the bread machine. Made earlier in the day and just kept warm on the back of the stove. The corn recipe I had planned was scrapped in favor of just boiling them up on the stove. 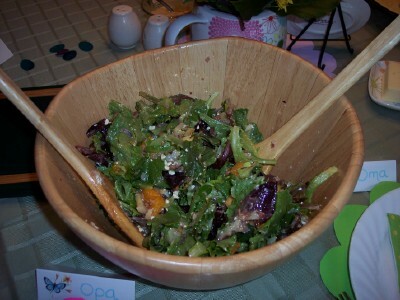 My girlfriend brought along a yummy Spring Orange Pear Feta Salad to go with it…mmmmmm. Finishing out the meal was the Strawberry Banana Trifle which is a lot of work I will admit but I prepared it the day before as well so it wasn’t too bad and it was definitely enjoyed by all. Now I’m not telling you all of this just to brag on myself. Okay maybe a little but only because had you told me just three short years ago that I’d be hosting holiday dinners at my house and actually enjoying doing it, I would never have believed you. I was the girl that didn’t cook (thankfully hubby picked up my slack) and avoided the kitchen at all costs except maybe to rummage through the cupboards looking for snacks. We didn’t do holiday dinners because the thought of it scared me silly. I’ve come a long way baby and I’m here to tell you if I can do it, anyone can! The best part…leftovers! I don’t have to cook today, yay!!! I hope all of you had a very blessed Easter weekend as well. Many of you also have today off. Enjoy! 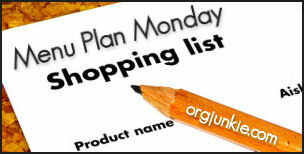 Don’t forget to get your free Weekly Menu Planning Template. Your table setting is so pretty. That is one area I really lack in – making the dinner table pretty and appealing. I don’t have many Easter left overs so I won’t be doing too many meals from that. I would love to have had leftovers…alas I dd no Easter dinner!. Your menu looks great! Thanks for hosting!!! LOL we’re having leftover Easter dinner tonight too! Your table looked wonderful! I have always wanted to decorate my table. 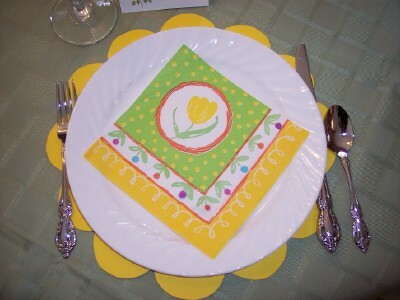 Love your Easter table set up!! SO pretty! Your dinner looks awesome! Never would have thought to put the ham in the crockpot. Your table is set pretty too. Wow, your Easter dinner looked amazing. I love how you simplified it to allow you more time for socializing. Thanks for sharing how you did that! Oh, my. Your Easter dinner looks yummy! Nice looking meal and well done! Great planning ahead too! Sounds like a tasty week at your house. Oops-my linkup says “giveaway”, but my giveaway is over…I forgot to delete that and I don’t know how to get it off my linkup. Sorry! I won’t be joining in due to illness this week, but your Easter table looks divine!! What a wonderful celebration! I love all of your pictures you shared. It looks like you had a lovely Easter! Your dinner looks great! Congrats! Sounds like you had a nice gathering. 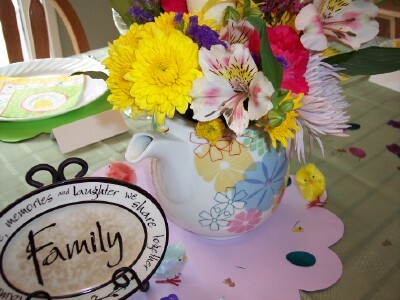 Great pictures and your table setting is so pretty. WOW! I am thrilled that I found your blog. I will be back and often! Your table was set so pretty. Looks like you had a lovely Easter Dinner! 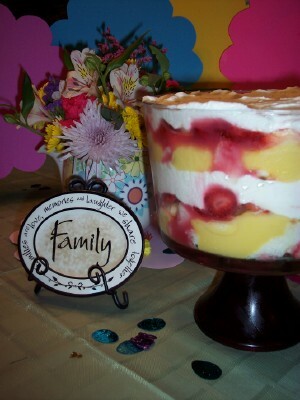 i am printing the recipe for that strawberry banana trifle as i am typing this!! thanks!! and thanks for another menu monday!! fantastic!! Your Easter dinner looks fabulous! I just love a trifle for dessert, too. Sounds like a great menu, have a great week! 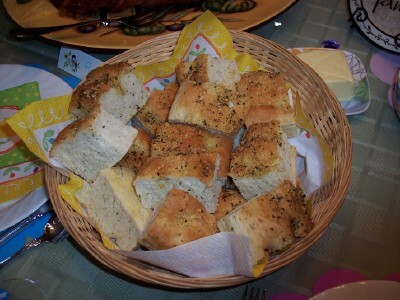 The focaccia bread would be a great change from the traditional rolls on Easter. I’m going to try them this week. I just got my mom’s old bread machine and I’m looking for some recipes. My first Mr. Linky post!! Whoo-hoo! Your Easter dinner looks delicious! 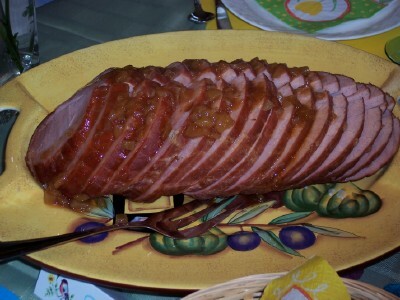 Love the way you cooked your ham. We did pretty well last week. I am planning of using the template that you’ve shared with us so that I can print out the menu for the week – last week I just wrote it on the kitchen calendar to avoid the dreaded, “Mom, what is for dinner?” that I seem to get 3-4 times a day. Today I am #207, so far I’ve not been deleted by Mr. Linky. I love to see what’s cookin at other people’s house. It really helps me with my own menu planning. Thank you so much for offering this on your site. Thank you so much for helping me last week so I could link my mpm. I think I have it down now. One more thing to thank you for is sharing that you weren’t always a menu planner. It makes me feel like anything is possible in this area of my life. I like to cook but always seem to cook the same things over and over. This site has given me lots of easy meals to make since I can’t stand very long at the counter. I have had one major holiday meal at my house, last Thanksgiving, and I was still working while everyone one was eating, and I really didn’t like that. Now I know I can do a lot more the night before. Thanks for everything. I really appreciate it. 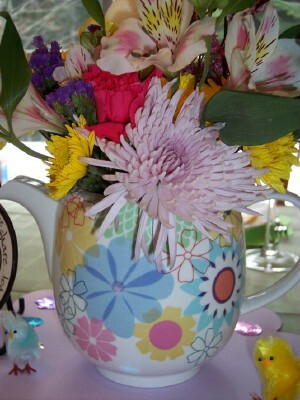 I am so glad you had a fabulous Easter celebration!! Your food and table looked great, and very festive. I am all for the leftovers! We are making a ham, spinach & cheese strata with ours. I am excited to try your garlic & teriyaki chicken recipes this week! When I make twice baked potatoes (without the bacon) I do everything the night before so I just have to put them in the oven the next and they’ve turned out fine that way too. Looks like your special dinner was great! 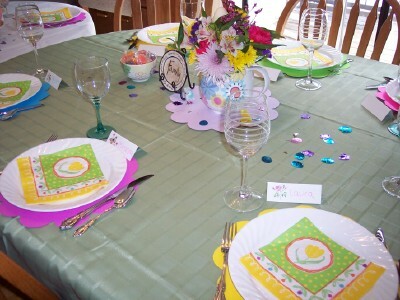 The Easter set up was so cute! Hi, this is my first ever Menu Plan Monday. I only discovered this site recently and I’m really loving it. Sorry about my double post above in Mr Linky. Can you tell I’m new? 😉 I was wondering if you might be able to remove the first link, which was incorrect. My pediatrician wants the kids off dairy for a couple of weeks to see if it helps some tummy troubles they’re having. I’m really stuck thinking of meals that don’t use cheese! What a delicious looking meal. Thanks for explaining all the pre-prep. I really like to make things as far ahead as possible as well. I really want to try that chicken recipe you have on Weds… I’ve looked at it before and sounds good. Btw, if anyone can help me w/ a Tanzanian pilau recipe I’d be forever greatful! You have every right to brag… i started to meal plan this January and boy does it feel good each day to know what’s for dinner! It took over 7 years to get here, but it’s great now! Thanks for all the great ideas for meals . However I’m in need of some help to plan meals for my 23 yr old son who has just become a diabetic #2.